Jared Unzipped: How To Make A Home Made Snow Globe. Snow globes are a wonderful part of the holiday season. They possess the power to convey a simple but definitive message of love and peace, all within the realm of an enclosed sphere filled with water. The contents of a holiday snow globe can vary widely, from birds to teddy bears and everything in between. Heck, you can even find snow globes for other holidays and events -- birthdays, Halloween, Fourth of July and so on. And now, you an make a snow globe within the comfort of your own home. This is a fantastic project to tackle with your family. Start by making sure your jar and lid are very clean and dry. If you want to paint your lid, do so first with an oil-based enamel paint. Use sandpaper to rough up the underside of the lid. This is where you'll be gluing your objects and figures for the globe. Go nuts here -- elves, reindeer, pine trees, gift boxes, miniature trains. Anything your imagination can come up with can be inserted into your globe (as long as it fits, of course). Make sure to use plastic or ceramic objects; metal items will rust inside the globe. Attach them to the lid with epoxy and allow to dry completely. Then, fill your jar almost to the top with distilled water (do not use tap water). 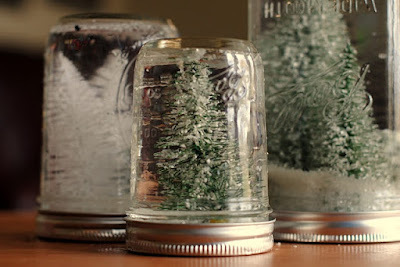 Add a spoon of glycerin and a pinch of glitter to fill the jar the rest of the way. Don't go heavy with the glitter, as too much can cause it to cake against the sides and bottom of the jar. Finally, screw your lid on tightly. You can add a very light coat of epoxy around the lip of the lid for added security if you desire. That's it! 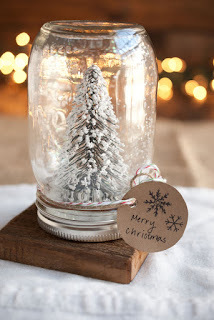 Flip your home made snow globe over and shake it. You just created a winter wonderland all on your own!